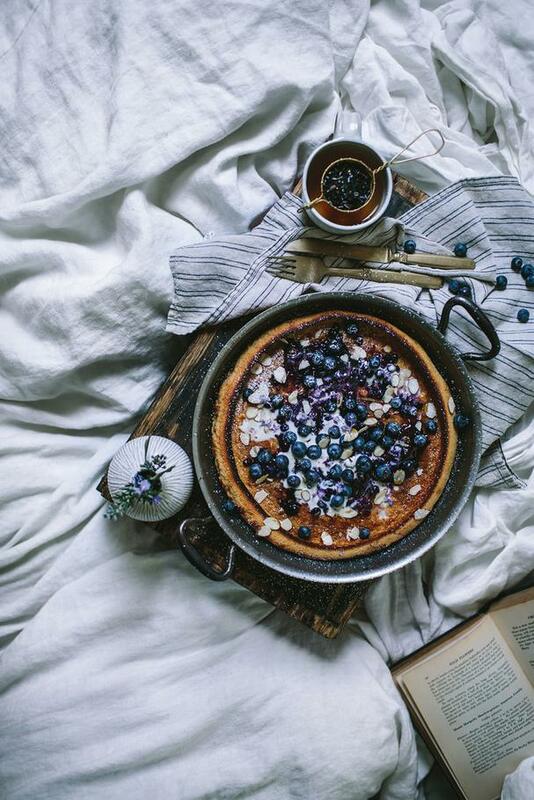 This scrumptious Blueberry Dutch Baby is the final featured recipe from the gorgeous new cookbook First We Eat by Eva Kosmas Flores. This beautiful garden-to-table book will inspire you throughout the year to eat fresh and seasonal ingredients in dishes (and cocktails!) that are both simple and elegant. 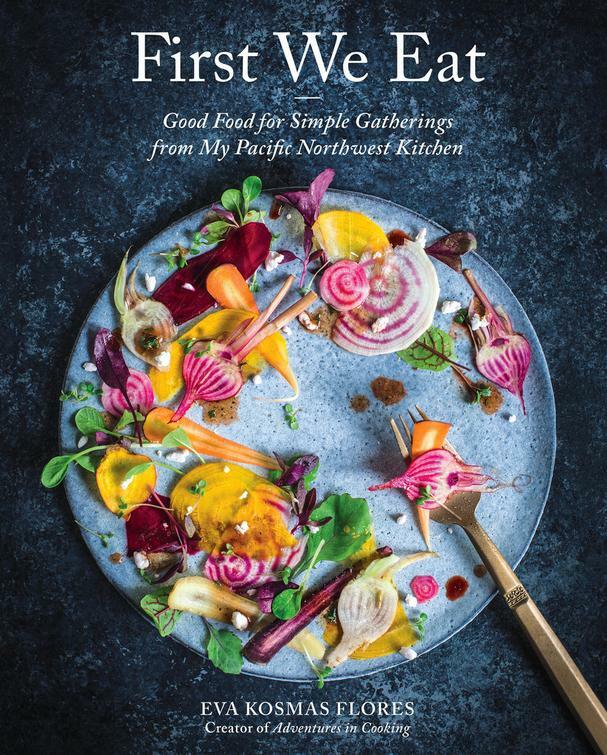 First We Eat is divided by season, each beginning with a menu, and also offers a guide to staple ingredients, homemade pantry basics, and tips for sourcing your ingredients. Get a perfect-for-spring menu below from some of the recipes I featured this week. In Summer, enjoy dishes like Feta-and-Paprika-Stuffed Squash Blossoms, along with Salt-Baked Trout with Sweet Pepper and Lemon, and Watermelon and Mint Blossom Granita. As the temperatures cool down, Autumn brings us dishes such as Pumpkin and Date Cassoulet, Chai and Poppy Challah (check out her amazing how-to video on Instagram!) and her Hot Buttered Hazelnut Milk. In Winter, try her Seared Scallops with Brown-Butter-Sage-Roasted Rutabaga Puree, the Braised Pork Spareribs with Fig and Anise, and for dessert the Rosemary-and-Date Roulade with Brown-Butter Buttercream. And that's just a taste of what this beautiful cookbook offers. Get her lovely cookbook here. You'll truly love it as much as I do. —For the blueberry sauce, combine the blueberries, sugar, and ¼ cup (60 ml) water in a small saucepan. Bring to a boil over medium-low heat. Reduce the heat to low and cook until the blueberries burst and the sauce cooks down and becomes thick and jammy, 10 to 14 minutes. Remove from the heat and set aside. —For the Dutch baby, preheat the oven to 425 °F (220 °C). Set an 11-inch (28-cm) au gratin pan or oven-safe skillet inside to preheat for at least 30 minutes. —In a medium bowl, whisk together the flour, cinnamon, nutmeg, ginger, and salt. Set aside. —In the bowl of a stand mixer fitted with the whisk attachment, beat the eggs on medium-high speed until frothy, about 2 minutes. Reduce the speed to medium and add the milk, sugar, and vanilla. Add the flour mixture and mix until just combined. Stir in 1 cup (145 g) of the blueberries by hand. —Carefully remove the hot pan from the oven and add the butter to the pan, swirling it slightly to help the butter melt quickly. Take care, as the butter will hiss and spit a bit when it hits the hot pan. Pour the batter into the pan and place it back in the oven. Bake until the pancake looks puffy and the edges curl up and are golden brown, 16 to 18 minutes. —Remove and garnish with the crème fraîche or yogurt and blueberry sauce. Top with the almonds, edible flowers (if using), and the remaining ½ cup (75 g) blueberries and serve along with the maple syrup, if desired.